Whiteface Region welcomes new business venture tyed into the opening of Fishing Season. WILMINGTON, NY -- Knot Your Average Fly-Guy, located in Wilmington, NY is pleased to announce a new partnership with virtual fashionista Raquel Bass formerly of Be Dazzled You. The new business will open a storefront along the West Branch of the Ausable River under the DBA Just Wade A Minute in mid-April 2016. Located in the fly-fishing capital of the Adirondacks, Just Wade A Minute was a venture just waiting to be cast. As related by Raquel Bass, the creative genius behind the business, it was all really just the brain-child of a big misunderstanding. Raquel recalls the first time her then-boyfriend Jack invited her to what he described as a quaint little village near Whiteface Mountain. She recalls him mentioning they were going to visit his trusty “fly-guy” for the weekend and she would need to bring a pair of waders. With waders being all the rage in New York City, Raquel spent a few happy days researching brands and styles at a variety of trendy Village shops. After selecting a couple of pairs that suited her style (because one is never enough! 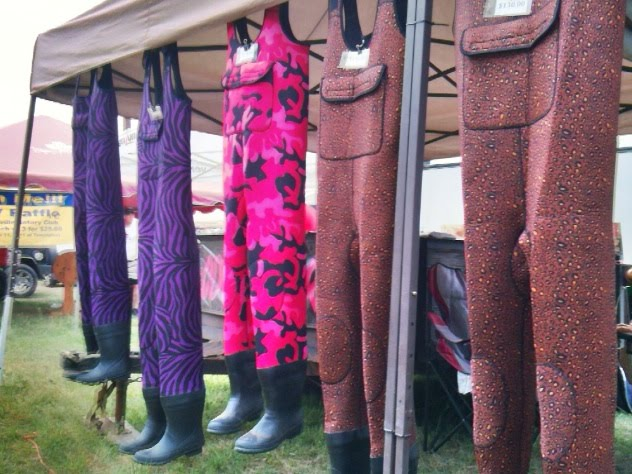 ), she wielded her bedazzler and proceeded to embellish the new waders with a selection of beads, rhinestones, and decorative accoutrement. Satisfied that she would be fashionably in style, she packed them in her suitcase, and prepared for a weekend of glamping under the stars. “Well, wasn’t I in for a surprise,” Raquel laughed. “You can imagine my confusion when Jack’s fly-guy was not one of his hipster friends, but a renowned gentleman of considerable age called Knot. At that point, I had no idea what I had gotten myself into. But, hey, I’m always up for adventure. “But, oh, the look on Jack’s face when I pulled on one of my new wader ensembles and joined him and Knot at the water’s edge for the first-time! Let’s just say he was more than a little embarrassed,” recalls Raquel. “How the hell was I supposed to know we were actually going fishing? 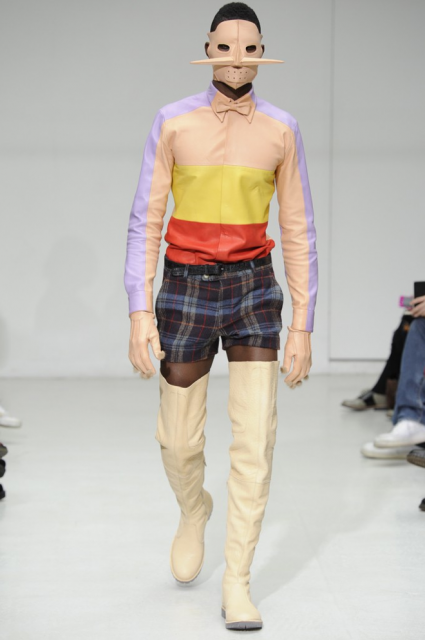 I mean, if you’re going to be vague about details, don’t be shocked when I show up dressed for a party." 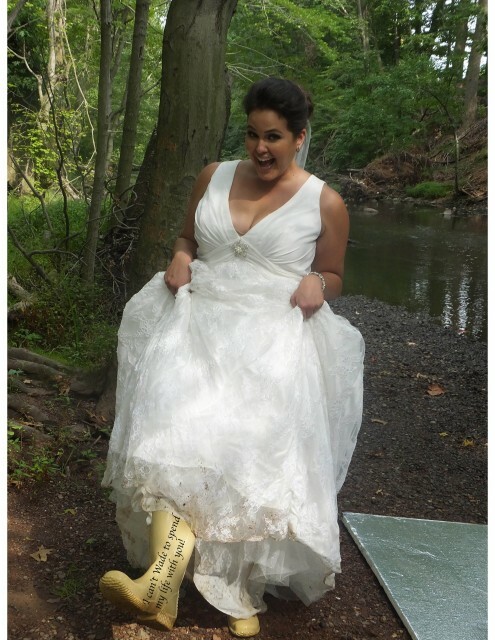 “Anyway, I was down for the challenge and so were my new waders. It seems the fish were even more attracted to my jewels and bikini than they were to Knot’s flies on Jack’s line. All I had to do was stand in the water and look pretty, and the fish were just swarming me. I mean, you could literally put your hand down and scoop them up - not that I would, man they’re slimy! 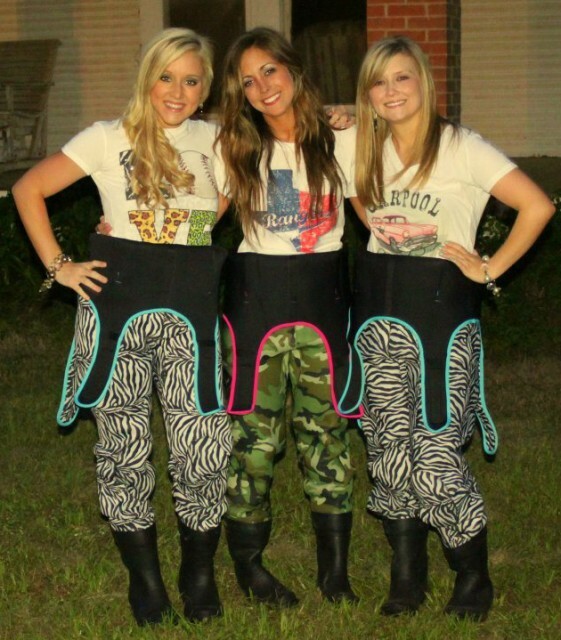 At Just Wade A Minute, you can browse a large selection of colorful, decorated one-of-a-kind waders, as well as bikini tops for all makes and models. Not to mention their large selection of team & competitive fisher-people ensembles. Just Wade A Minute also carries a diverse supply of designer wear for cooler weather. 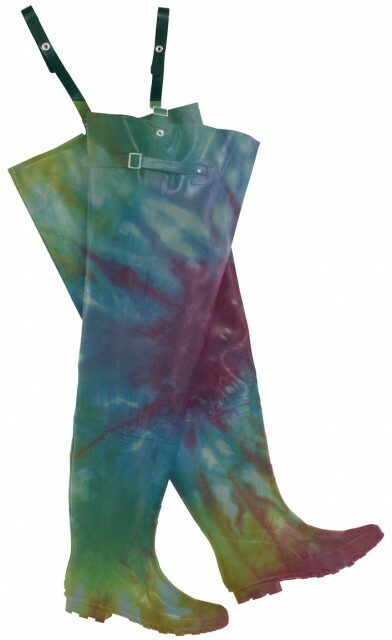 Looking to incorporate a special theme into your waders? 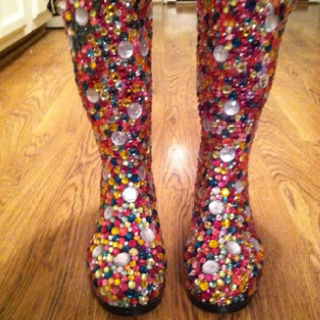 Visit online and custom-order your pair. Raquel has designed for Ausable River Two-Fly Competitors; fishermen determined to attract a variety of landlocked Salmon, lake trout, splake, bass, pike, walleye, perch, and sunfish from the renowned West Branch; and even a pair of hand-calligraphed waders for a bride that cast her vows near High Falls Gorge. The public is invited to the Just Wade A Minute grand opening on April 15 at dawn, the day will be full of activities, workshops, and beaded giveaways for the whole family, and will end with a complimentary catch-and-release party and fish-fry.